Home > Blog > Can You Be Bonded After A Bankruptcy? It Depends. Obviously nobody wants to file for bankruptcy, but sometimes people have no choice. A bankruptcy can affect your life in many ways and it is only natural for you to want to know more about them and be better prepared. One way in which a bankruptcy can have an impact on you is by affecting your chances of getting bonded, i.e. obtaining a surety bond. Not all bonds, however, are the same. To what extent a bankruptcy will affect your ability to get bonded will depend on the type of bankruptcy, the type of the bond and several other factors. Whether you have recently filed for bankruptcy or have one on your history read on to find out how you can still get a surety bond. 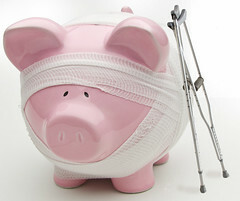 Can YOU be bonded after a bankruptcy? Apply now and find out! Like I said, when an applicant has filed for bankruptcy, whether they can get bonded or not will depend on the type of the bond they wish to obtain. There are two main types of surety bonds: license bonds and contract bonds. You need license bonds, also known as commercial bonds, in order to get a business permit or license for your business. For example, an auto dealer in Texas will need an auto dealer bond and a mortgage broker in New York will need a mortgage broker bond if they want to legally operate in their respective states. That being said, there is one type of license bond, which some employers require from their employees or prior to hiring a cindadate. It is called a fidelity bond and it protects employers from some common forms of employee dishonesty such as theft and fraud. People are frequently concerned about their ability to get that particular bond following a bankruptcy. Then there are contract bonds which are a bit different. Also called construction bonds, they are required from general construction contractors working on certain public projects. A bankruptcy makes you a high-risk applicant, but you can still get a surety bond. In order to know how a bankruptcy can affect your ability to get a surety bond, you need to know more about how the bonding process works. When a surety underwrites your bond, they assume a legal and financial responsibility on your behalf. That is why they prefer to work with applicants which pose a smaller risk of trigger a claim and getting them involved in legal trouble. They take your personal credit score as on estimate of how like you are to fulfill your contractual obligations, therefore not cause a claim to be filed against you. If you have bad credit (typically 650 or below) you will be considered high risk by the surety. The end result is that you either cannot get bonded or can do so but at a higher price. Now is the time to say that high-risk applicants can obtain license bonds, but not contract bonds. As you are probably aware, filing for bankruptcy will severely compromise your credit score and will automatically turn you into a high-risk applicant. It will continue to impact your credit score for as long as it is listed on your report, depending on the type of bankruptcy. A bankruptcy in itself is also considered a read alert for your surety along with other credit issues such as unpaid dues, civil judgments or tax liens. Still, you shouldn’t get discouraged as most high risk applicants are able to obtain a license bond. 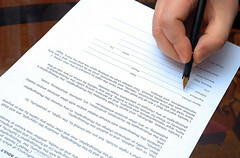 The only exception to this is if your bankruptcy is open in which case sureties are certain to deny you a surety bond. It’s best to disclose your financial history during job interviews. Even though fidelity bonds also fall under the category of license bonds, there are people who worry they won’t get the bond and will be denied a job position. You should know that is illegal for any employer to discriminate against you, whether you are an employee or a job applicant, just because you have filed for bankruptcy. There is a market for high-risk applicants for fidelity bonds, so you should be able to obtain the bond without too much hassle. If your criminal record is clean, this will further increase your chances of getting a bond. The only exception might be if you are applying for some government positions, such as high positions at the U.S. Treasury, but these are very rare cases. Keep in mind that the bond requires you to disclose your financial history of up to 10 years to your potential employer, so your best policy will be to be honest as possible during the interview. Lance Surety Bonds has a rich expertise in bonding applicants with all sorts of credit issues. If you are worried about your bankruptcy affecting your ability to get bonded, call one of our agents and (877) 514-5146 and they will be happy to assist you. Thank you for educating myself and other small business owners on this subject matter. I am just starting out in the freight broker industry and this particular article is a consideration that must be weighed when applying for my surety bond. In speaking with other small business owners in the industry on this topic I have been told figures of $1200 – $3,000, however, these numbers seem awfully high and would kill anyone’s budget, especially just starting out. What are your thoughts and expert advice on this? Also, If I am progressively demonstrating improved credit behavior leading up to applying for my bond would this also be taken into consideration? (As I know each person is case by case I these situations) Lastly, what are the typical initial down payments and mo/qrtly/yrly rates high risk applicants such as myself can expect to see with the recent increase to $75K bond required for freight brokers? Thank you in advance! Thank you for reaching out to us regarding the $75,000 BMC-84 Freight Broker Bond. Rates for this bond can vary substantially depending on a number of factors such as the business owner’s personal credit and industry experience. For more information as well as a rough estimate on possible bond costs, take a look at our page on Freight Broker Bonds at http://www.suretybonds.org/freight-broker-bonds. 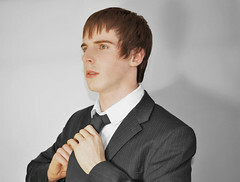 As you mentioned, taking action to improve your personal credit can only help towards reducing the overall bond price. To get approved at the lowest possible rate, underwriters prefer to see clean credit history, without recent delinquencies, public records or other past due items. Lastly, freight broker bonds are most often paid for in one lump sum on an annual basis. First year premium is fully-earned upon the bond being filed. However, after the first year return premium is offered on a pro-rated basis. If you have any other questions please feel free to give us a call at (877) 514-5146 or email [email protected]. If you’d like a free quote, you can apply online in just minutes at http://www.suretybonds.org/online-application. Do you need to be discharged within 3-5 years ago? My apologies for the delay in replying to your question. This ultimately depends on what type of bond you are trying to secure. If for example you are applying for some sort of license bond, such as an auto dealer bond, there are a couple bond companies in the current market that will consider writing bonds for applicants that are working through an open bankruptcy. However, most sureties like to see bankruptcies that have been discharged for a few years. The longer it has been closed, the better your chances will be of obtaining the lowest possible pricing for your bond. If you’re looking to secure a contract bond that is guaranteeing performance of a specific construction-related contract, bond companies like to see bankruptcies discharged for at least 7 years, as the underwriting is more strict and selective. If you have any other questions, or would like to know more about a specific type of bond, please give us a call at (877) 514-5146. There is a chance to add to our company another partner and becoming a LLC Partnership instead a S Corp. My question is, will be affected our credit since our new partner had filled a bankruptcy 10 years ago? we work with city contracts which involves being bonded. At this present time, we never had any issue against us. Please let me know. You brought up a very good question. As long as the bankruptcy was discharged over 7 years ago, it should not negatively impact your company’s ability to secure bonding. Each bond company that writes contract bonds will have their own underwriting standards that they follow, however, and depending on the size of the contract you are looking to bond the sureties may need to review additional company information, such as business financial statements. If you have any other questions, please give us a call at (877) 514-5146. Thank you!